...taps into the glamour and prestige of Chopard’s Haute Joaillerie association with celebrity and red carpet events. Stars on the red carpet are beautiful, charismatic glamorous with a touch of Extravagance; they capture all eyes and enjoy the moment. They bask in the spotlight. Cascade refers to a Chopard cascade of diamonds worn by the stars on the red carpet. 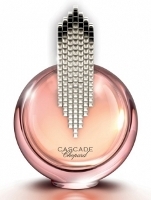 Cascade features notes of grapefruit blossom, pink pepper, mandarin, orchid, wood, amber and musk. I can’t get past that 80’s style bottle. ;0 Kind of tacky looking. Pretty sure it will make my list of least favorite bottles of the year. Disgusting bottle! It needs shoulder pads! I think the bottle is kind of pretty, actually. It looks as if the cap should be a detachable earring. But the juice has PINK PEPPER IN IT. Did IFF or Firmenich make a hundred million gallons of the stuff and force all the companies to buy it? Because it was in everything just a couple of years ago, and I thought we were over it, and here it is again. Good, glad someone will stick up for it! On the pink pepper, don’t think it will ever go away. I think the bottle’s pretty too, though I’m not much interested in the juice and have way too many other things to sample. This sounds incredibly generic, and the bottle looks tacky. I predict it will drop like a stone into oblivion within moments of release. LOL…Chopard hopes you are very wrong! ugh, i wished people would get more basenotes than the old “sandalwood, amber, musk”. it’s getting really boring down there. clearly there must be more ingredients that will last as long. Au contraire! Bring those notes on and bring ’em strong! If anything, I wanna hang myself if I have to test another scent with cedar and/or fake patchouli in it. but those are typical basenotes too. i want some new, less used basenotes. Just want to point out that we don’t know all the notes…might easily have cedar & patch, who knows. They never list everything. I can’t believe that most people found this tacky. I love the bottle!!! My gut reaction was “Woow, such a classy bottle!” so I guess I am in chopard’s target demographic! I guess that you guys are more clever, can see throught the lighting and and that up close the “cascade of diamonds” looks more like “cascade of painted plastic” . I am not sure if we get chopard perfumes here in Argentina. I will post an update if I see one. Classy in a Dynasty or Dallas kind of way? ;0 Just messin’ with ya. You are right, but you see, I plead brainwashing by hollywood!!! I grew up watching american sitcoms and series. In 1983 I was 10 years old and Dukes of Hazzard, Dynasty and Dallas were all the rage! So far (have not read to the bottom yet) it’s about 1/2 & 1/2, so not true that most people are finding it tacky! For my part, (and I’ll get in trouble here maybe) even a real cascade of diamonds would be tacky, so that might explain why a fake one doesn’t appeal to me. I like the bottle, too, but it seems kind of retro-kitschy to me at the same time. The juice doesn’t sound for me. Regarding pink pepper, oh, it’s so beautiful as a raw ingredient — but so are many things. I presume it’s just a fashion. It is cheap as all get out though, seriously, as a raw material, and it combines nicely with a lot of other fashionable aromas. It’s pink grapefruit I am tired of… it always smells sweaty on me. Just re-read. Grapefruit blossom? Hmm. I’m guessing there’s grapefruit, but who knows. Based on the picture…I like the bottle too. Also, I like pink pepper and could do without pink grapefruit. I LOVE THE BOTTLE! OH MY! I think it is Very Chic! i don’t find it Tacky or Retro! well maybe retro in a Fantastic Art Deco Chrysler Building kinda way, but stil FABU! Glamourous… OH YES! the notes seem interesting enough, maybe a little generic, but they could be blended in an amazing way (Chopard usually does a great job making memorable delicous fragrances) and love the idea of using Fleur De Pamplemousse! I want to smell it just for that! I thought art deco too. From an architecture major…definitely art deco. I’m a long time reader/lurker, first time poster, and I just had to break my silence to say how much I love the bottle! It makes me think of the 1920s, Art Deco, and jewelry — I love the color of the bottle and the extremely tacky top! The bottle also *strongly* reminds me of the bottle for Exclamation! (I hesitate to say “is a direct ripoff of”); am I imagining a resemblance? Maybe it’s time for me to go to bed…. I did not think of Exclamation, but you’re right, it really does. Robin, how do you get your fragrance samples? Finally, after 4 months, I recv. my sample of Casacade from the dist. On my body, upon spraying, I immediately thought of Cashmir, with a touch of Pink Pepper. It smells nice. It’s lunch time now, and the scent is fading, this fragrance really doesn’t have good staying power. It varies! But have not tried Cascade as yet, glad to hear it’s nice. It smells fruity sweet, has no lasting power (on my skin) and is not something to remember. It smells as so many fruity sweet scents, nothing special and nothing original. Still haven’t smelled it, & don’t even know if it’s available in the US yet.